We love when couples have fun and crazy photo ideas! Call it the nerd in us, but we thrive on silly stuff like this! 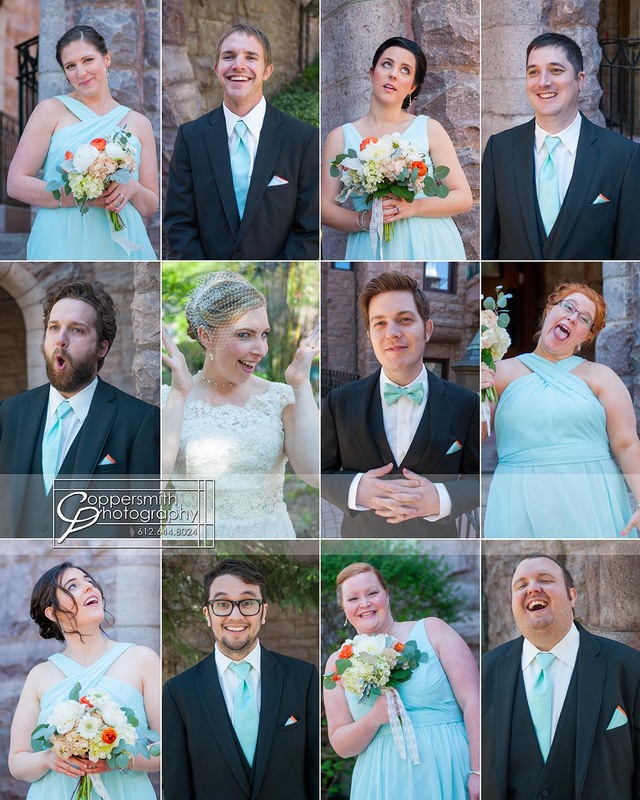 Emily and Stephen wanted to create a fun layout with the wedding party, showcasing each member, and their personality. Their wedding party had 5 bridesmaids, and 5 groomsmen. Their reception was at the stunningly beautiful VanDusen Mansion downtown Minneapolis. It was a perfect setting to have each background be a little bit different, but similar enough enough to create a uniform backdrop. So, what sort of photograph can you do with 12 different people, and still showcase each one individually? This! 18 May	This entry was published on May 18, 2015 at 4:12 pm. It’s filed under Details, minneapolis photographer, minnesota photographer, minnesota wedding, portrait session, Wedding, wedding photography and tagged #metzquast2015, art out of everything, artoutofeverything, best minnesota photographer, best wedding photographer, bridal, Coppersmith Photography, coppersmithphotography, fun wedding photos, minneapolis, Minnesota, minnesota photographer, minnesota wedding photographer, photography, real wedding, reception, St.Paul, top wedding photographer, van dusen mansion, wedding, wedding party, wedding photographer, wedding photography, weddingreception. Bookmark the permalink. Follow any comments here with the RSS feed for this post.